Detta är ett zoom-objektiv som tillverkats av Sigma och modellen lanserades 2007. Whether you’re a beginner or an experienced photographer, the Sigma 18-200mm F3.5-6.3 DC OS is an all purpose lens offers convenience and features on all levels. Its versatility allows the photographer to capture wide angle photos such as scenic, landscape or group photography and at the telephoto end is great for sports action. Portraits are also within these lenses capabilities. Compact and lightweight it’s easy to carry and it will always deliver amazing images. Three Aspherical glass elements offer correction for distortion, Special Low Dispersion glass provides optimum color correction & sharpness, Super Multi-Layer lens coating reduces flare and ghosting and assures high image quality throughout the entire zoom range. 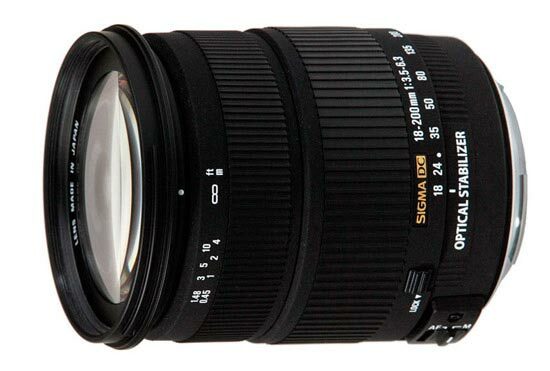 Sigma is proud to have introduced the 18-200mm F3.5-6.3 as one of the first of its kind. Equivalent roughly to a 24 to 300mm lens in the larger format cameras, this lens has an impressive range and can deliver stunning images. "